Davington Priory was built in 1153, at the north of a 'plateau' by Davington Hill. A little research suggests it may once have been a small island, bounded on the east and south by the Westbook stream, which until the 1960s rose some miles away at Whitehill and still flows into Stonebridge Pond, and on the west by another of its arms. 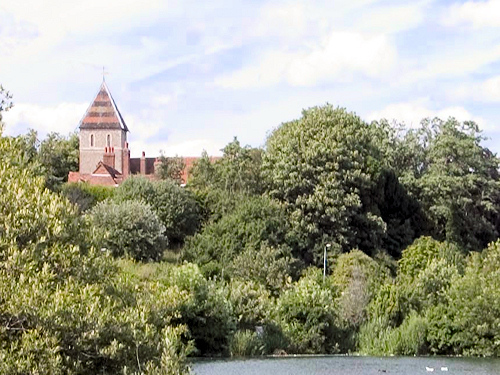 From some viewpoints (the top of Partridge Lane, for example, or the foot of Brent Hill) the tower of the church is still a commanding presence. Close your eyes to 18th and 20th century intrusions and imagine how commanding the twin presences of Court and Priory in their entirety must have been when seen from Faversham 500 years ago. There was no bridge at Stonebridge and both could only have been reached from the town by the ford at the foot of Tanners Street. Both were on Faversham's doorstep and depended on it for the essentials of daily life, yet both lived isolated lives, playing no part in its affairs. Until 150 years ago Davington remained what it had always been, a rural parish of fields, pastures, woods and marshland with a population of barely 150. Its only industry was a mile from the town centre - the Oare Gunpowder Works (wholly in Davington) that operated on a site so silent and densely wooded that, according to one observer, it could have been mistaken for a game reserve. The Priory, a Benedictine nunnery, is unusual in that much of it escaped demolition at the Reformation. This is not because for once the authorities were soft-hearted, but because it petered out before Henry VIII could dissolve it. In 1527 only the prioress, one nun and a lay sister were left. 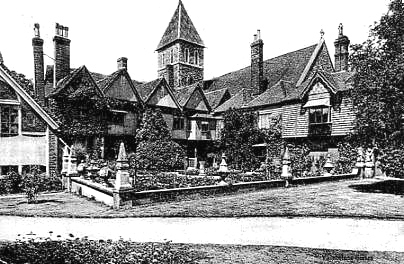 When the last nun died in 1535 the propertyautomatically passed to the Crown, which sold it to Sir Thomas Cheyney (?1485-1558) who lived at Shurland, a kind of mini-Hampton Court, on the Isle of Sheppey - as the crow flies only a few miles away and in those days easily reached from Davington via Harty Ferry. What little remains of that great house was restored by the Spitalfields Trust in 2009. Cheyney was a figure of national standing - treasurer of Henry VIII's household among other things. The nave of the fine Norman church remained in use as the parish church, and continues as a place of worship today. The choir had been demolished by 1580 and its stone foundations robbed to provide roadstone for local use. Part of the cloister and the nuns' domestic quarters were converted into a house. Anomalously the parish church was now privately owned and it was not until 1931 that both church and house were bought by the Church of England. In 1972 the C of E sold the house to Christopher Gibbs, a fine art connoisseur, who sold it on in 1982 as a private residence. A Huguenot community settled in Faversham in the 1680s and members worshipped at Davington Church, before moving to Preston Church. Originally the church had a pair of towers at its west end. Only one now survives. When and why the second (northern) tower was demolished is unknown. However, it seems it was either taken down during the Elizabethan demolition or early in the 17th century at a time when the Edwards family, then owners of the priory estate, undertook further works. It was certainly demolished by 1692 when there is a recorded reference to the church having a single tower. The twin towers of Reculver Church, just east of Herne Bay, are based on Davington's. The story is that in the 13th century a prioress of Davington was shipwrecked off Reculver. She prayed to the Lord she might not drown and vowed that if she survived she would build twin towers at Reculver, like those at her own church, to serve not only as belfries, but as beacons for seamen. Her prayer was answered and she kept her promise. By 1845 both church and house were badly neglected. They were bought by Thomas Willement (1786-1871), an artist who pioneered the revival of stained-glass painting in England. He had undertaken commissions in the area and was looking for a retirement home. Undeterred by the proximity of the gunpowder factory he set about restoration work, which he undertook sympathetically. Willement kept a notebook detailing progress and this is now in the Faversham Society's museum collection. He also wrote the first history of the parish. Then, as now, there were apocryphal stories of a tunnel connecting the Priory with Faversham Abbey. It would have had to be at least half-a-mile long and pass under the Creek, but Willement dutifully undertook excavations, finding nothing.